The battle for the 2018 SAM Tech NHRA Factory Stock Showdown championship went down to the wire with the three leading title contenders; Top Fuel star Leah Pritchett, Stephen Bell, and Arthur Kohn, all reaching the semifinal round of the season finale at the AAA Texas NHRA Fall Nationals in Dallas. Kohn and Bell entered the Dallas event tied for the lead while Pritchett was just one point behind, creating a scenario where whichever driver advanced the farthest would likely win the title. Not surprisingly, when the 16-car field was cut to four, all three remained in competition. 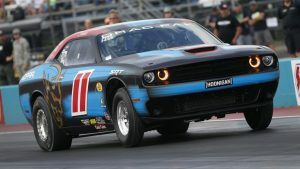 In arguably the most dramatic round in the brief history of the class, Pritchett gained the upper hand in the semi’s when she drove her Schumacher Racing Dodge Drag Pak Challenger to a win over Gainesville winner Bell. 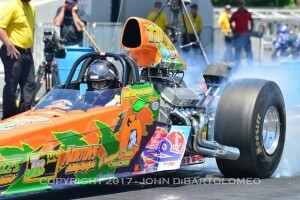 Pritchett, the winner of the two most recent events in Indianapolis and St. Louis, won with an 8.10 after Bell’s car lost traction and he was forced to roll out of the throttle. In the next pair, Kevin Skinner played the role of spoiler to perfection when he drove his Cobra Jet Mustang to a narrow 8.137 to 8.130 holeshot win over Charlotte champ Kohn’s COPO Camaro. The final margin of victory was just .002-second. With the top two points earners on the sidelines, Pritchett locked up her second title, adding to her previous Nostalgia Funny Car title in the NHRA Hot Rod Heritage Series. While the championship locked up in the semifinal round, Pritchett still had unfinished business in the final when she tangled with Skinner, who was the low qualifier with an 8.09 and drove to consistent wins against Mark Pawuk, and Randy Eakins. 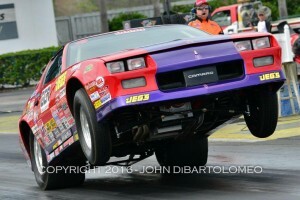 Pritchett, who struggled in qualifying, made her way through eliminations with wins against Aaron Stanfield and Randy Taylor, was consistent in the final with an 8.109, 169.02 and took the win after Skinner’s car also got loose after a big starting line wheelstand. 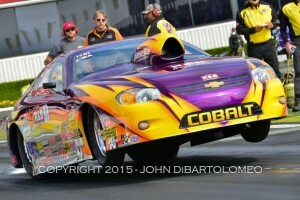 “Our mentality coming in here was one round at a time, and even one burnout at a time,” said Pritchett. 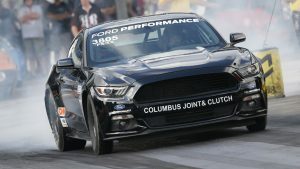 “That was our whole approach to this weekend and it worked.” In its first full season as a stand-alone class, the seven-race SAM Tech NHRA Factory Stock Showdown has quickly become a fan favorite at NHRA events with side-by-side competition between factory-built Challenger, Mustang and Camaro race cars from Dodge, Ford, and General Motors. 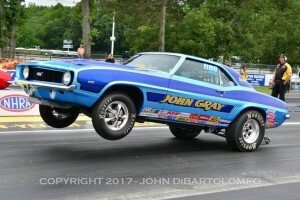 Using supercharged engines, Factory Stock cars are capable of seven-second elapsed times at speeds of over 170-mph on a nine-inch wide rear tire as mandated by class regulations.